Can universal portable chargers make the problem of flat batteries a thing of the past? 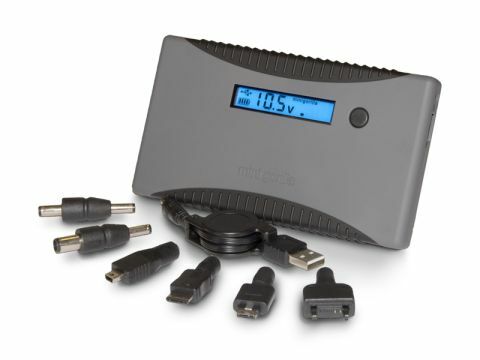 The Minigorilla is the little brother of the Powergorilla, Powertraveller's portable power supply/charger for laptops and other portable devices. This lower-cost unit has a smaller battery and is aimed at users of less power-hungry devices. Because of this, the range of voltages on offer (8.4V, 9.5V, 10.5V and 19V, plus 5V for USB-powered devices) is a better match for netbooks than laptops. The unit can charge from any mains outlet worldwide using the various plug adaptors. On a full charge, you can run a typical netbook for two hours once its batteries are exhausted, or charge a mobile phone six times or more. Inevitably, there's a snag: you have to carry a range of adaptors to match your portable devices. The Minigorilla is supplied with 18 adaptors, but you might only need two or three of them – and although these are small and easy to lose, the fact that the Minigorilla comes with a neoprene carrying case with a pouch for them does help.